A leader of the notorious Zetas drug cartel has been caught in Mexico City, according to Mexican Authorities. José María Guízar Valencia is wanted in the US, which had offered a $5m (£3.6m) reward for his capture. Known as Z-43, he is a dual US-Mexican citizen and is thought to have run the Zeta's south-eastern operations. The US state department said he was responsible for "importing thousands of kilograms of cocaine and methamphetamine to the US every year". 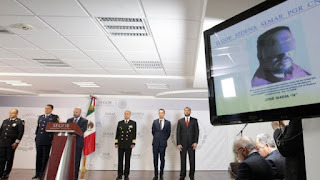 On its website, it said the Zetas "have murdered an untold number of Guatemalan civilians during the systematic overtake of the Guatemalan border region with Mexico during recent years".